School halls can either be a blessing or a curse for teens depending on how much they enjoy themselves when they are there. Teenage and school years are a tough combination to handle, especially considering the bullying and consciousness about looks. A poll encompassing 2,000 teenage girls found out that 9 out of 10 girls had a poor impression about their body image. Only about 8% of the respondents confessed that they were happy with their appearance. So, adding braces to the mix only complicates matters further. However, days are gone when braces were not a high school famous girl’s thing. Numerous people from celebrities to pop icons have realized the significance of braces for a perfect smile in the future. There was a time when braces were uncommon. Only a handful of people wore them to correct their crooked teeth. However, awareness concerning the need for braces for aesthetic and dental purposes has increased. According to the American Association of Orthodontists, four million people in the US wear braces. The estimates also reveal that the number of braces users has almost doubled between 1982-2008. Once you tell yourself that you are not alone in this, you can take up your confidence level by several notches. Your braces are not permanent. They are only the means to an end of a perfect smile with straight teeth. Remind yourself that it won’t be long until you rid yourself of facing situations where your dental problem or teeth embarrass you. In an online survey with a participant pool of 1,000 people, researchers found out that roughly two-thirds of Americans tend to remember attractive features. As per the survey, teeth make up an essential feature that people consider memorable. Since people are so conscious about looks, it’s best that you get your teeth fixed while you’re still in school. Therefore, shift your focus toward the future when you get the smile that you desire. It is best to dismiss negative thoughts and encourage positive ones in their stead. Be mindful of your thoughts. This way, you can recognize and keep out the negative thoughts. To leave little room for negativity, get rid of phrases like “I can’t,” “I hate,” and so on. Instead, replenish your vocabulary with words such as “I can,” “I will,” and the like. A positive attitude can significantly improve your confidence. What’s more, surround yourself with good friends and positive company. This will help enhance your confidence as well. You are not defined by the way you look or your braces. If you still feel that your braces are taking a toll on your confidence, try and divert your mind to keep yourself distracted. Work on your interests, habits, and passions. As you develop these and succeed in other areas, your confidence will start to shine through and ultimately, you’ll stop caring about the way your braces look. Instead, you will feel confident and proud of the progress that you’ve made. Braces for Teens come with a variety of other issues including foul breath and dental concerns. If you are not careful with your oral and braces cleanliness, you can end up with a lot more difficulties than what you started with. To beat this problem, clean your braces thoroughly and reduce the probability of embarrassing moments and confidence dips. Floss and rinse thoroughly while cleaning your braces. This helps you reduce bad breath and cuts the risk of developing gingivitis. What’s more, it helps you get rid of chunks of food particles in your teeth. 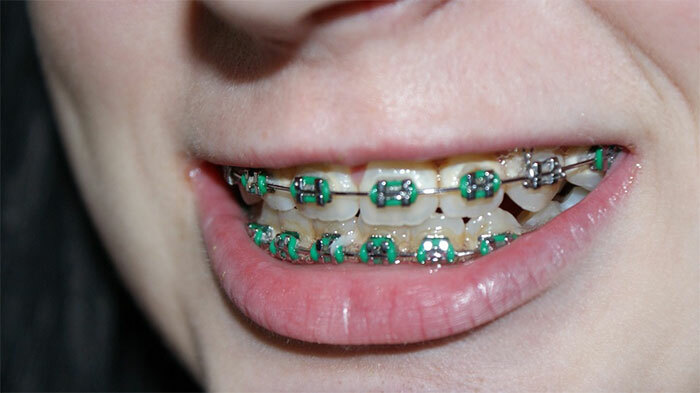 Lastly, you can enhance your confidence by adding some personality to your braces. If metal braces are not your first preference, talk to your orthodontist for alternatives. Chances are that you can get your teeth properly aligned via invisible aligners or ceramic braces. If not, then you can spice up the look of your traditional, metal braces by getting different colors for the bands in your braces that hold the brackets. Choose your favorite color or opt for a color that syncs with the holiday season. Although confidence and braces have a complicated relationship, you can always work on your confidence in several ways. Take care of yourself and don’t let the temporary pair of braces rip your self-esteem. After all, they are only a means to a bright end.